Welcome to Day 3 of Family Friendly Food Week! Today, a sweet, smart, and witty friend of mine has a fantastic, guilt-free dessert recipe to share. Have you linked up a post to the Family Friendly Food link party yet? 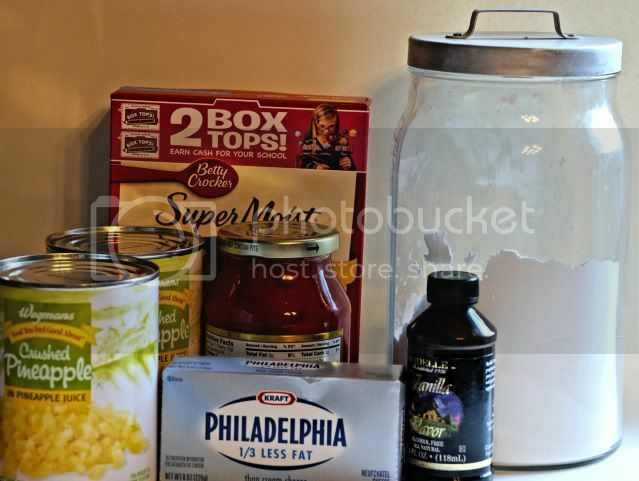 Any recipe, kitchen/pantry tip, meal plan or snack idea, couponing strategy, etc. is welcome. Don't miss the Meal Tips and Perfect Planner Giveaway from Tuesday...Jenny is offering a copy of her eBook to help one reader get organized! Please help me welcome my friend Meri--she has a drool-worthy recipe and some good tips to share with us. Be sure to read her footnotes--funny and informative! Hi everyone! 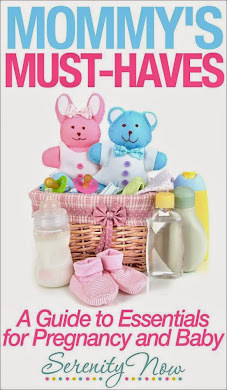 My name is Meri and I write a teeny tiny little blog called two (parents five (kids) 365 (days). I mostly talk about my kiddos over there, but I tend to wear a lot of hats in my daily life in addition to that of mom: wife, chef (in the loosest sense of the word! ), chauffeur, knitter, crafter, DIY-er, teacher, MOPS Field Leader, and fledgling runner, so I sometimes write about that stuff too. 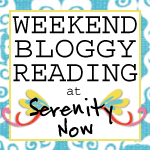 I am really excited to be guest posting here at Serenity Now! I have a tasty recipe to share with you, but first I want to share a little bit about my personal journey with weight loss and living a healthier lifestyle. I want to rock skinny jeans instead of endure them. I want knee high boots to fit around my calves. I want to shop in the regular size section and not the plus section. I wish I could say that there is some medical reason for my extra weight. Not that I think that people who have gained weight due to medical conditions or medication have it easy--but at least it would be a "good" reason, ya know? I also don't have an unusual relationship with food: I am not an emotional eater, I don't eat to hide past pain or anything of the sort. And when I find something I like, I tend to eat a.lot. of it. I have had some small successes in the past with programs like First Place and Weight Watchers, which are both essentially calorie counting. My problem was, I would get pregnant again or I would decide that losing 20 pounds was enough, and give up. Plus, I have a problem with things like diet food and fake sugar (which Weight Watchers relies on heavily to replace the sweet things that you eat everyday). I knew that if I were to try this weight loss thing again, it would have to be in a way that I could sustain for the long term. And, it has worked. I have lost 50 pounds since I made the decision in May to shed the weight. You wanna know my secret? Eat Less. Move More. Make Smarter Choices. Leave Guilt Behind. I eat things that I love3, just smaller portions. I do try to eat as lean as possible. For example, we drink 1% milk rather than 2%, I try to choose 2% cheeses (don't get fat free4. Something ain't right with cheese that doesn't melt) and if I can substitute a lean choice with a full fat choice in a recipe, then I do. But if I want a cupcake, then I have a cupcake. And I don't feel like I have to starve myself for a day or run a marathon to make up for it. Because if I didn't allow myself to have that cupcake, I would dwell on that cupcake. It would invade my thoughts all day long. I would think about it at every meal. I would stalk cupcake recipes on the internet. I would start seeing cupcakes everywhere I went. I would become a slave to the cupcake, and then, when really all I wanted was a little treat, I would instead eat a whole tray of cupcakes. The thing is, we shouldn't be slaves to food. It should taste good, it should be good for you, it can even be occasionally decadent. But it shouldn't rule your life. Inspired by Gina from Skinnytaste's Pina Colada Cupcakes, I tweaked her recipe and came up with these. 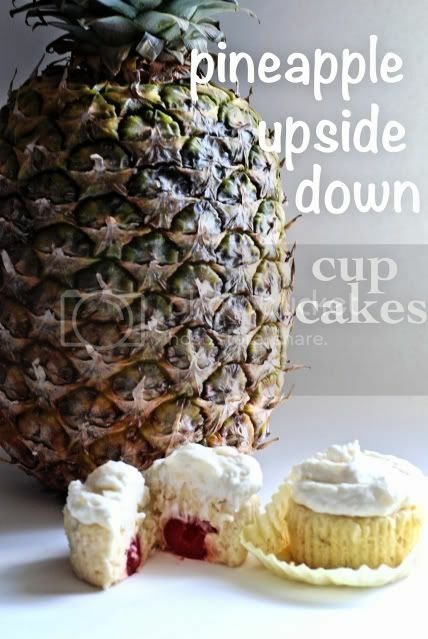 They taste decadent, but in comparison to other Pineapple Upside Down Cupcakes5-with NO frosting, by the way- they are a nice, skinny treat at right under 170 calories each! 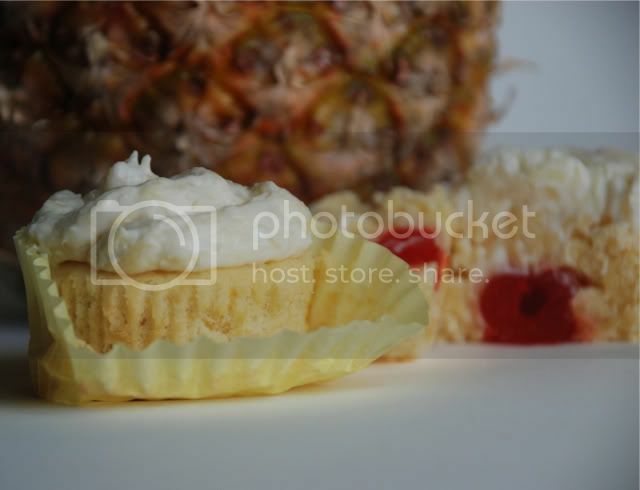 Cast of tasty characters for both cupcakes and frosting: Yellow cake mix, crushed pineapple, maraschino cherries, 1/3 less fat Philadelphia cream cheese, powdered sugar and vanilla. Bake according to the directions on your cake mix packaging. Keep an eye on them though, and test with a toothpick. There's nothing worse than an over (or under) cooked cuppy! 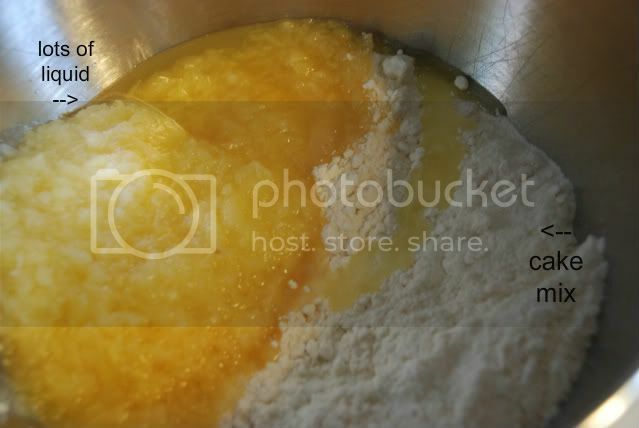 Then add in 1/4 c. powdered sugar and beat on high until well mixed. It isn't going to look like thick, traditional frosting. It will be soft. Frosting is supposed to be a topping, not a dessert unto itself. At this point, if I am not taking these as a treat to a gathering of some sort, I will freeze some of the cupcakes with no frosting and then take them out when I have a hankering for something sweet.6 (Without frosting, they are around 98 calories each.) You can also make the frosting and keep it in the fridge so you can frost them as you are ready to eat them. I have found it will last a couple of weeks if kept stored in a tightly lidded container and refrigerated. Don't frost the cupcakes until they are completely cool. Otherwise that frosting will just melt and slide right off. Keep everything refrigerated until ready to serve. Follow directions on box for preheating your oven. 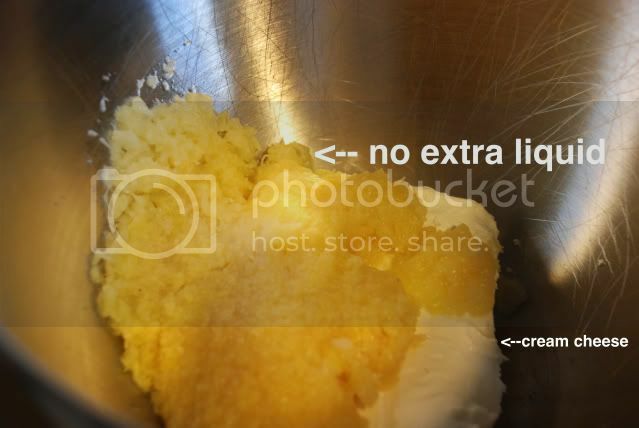 Combine cake mix and undrained pineapple until well mixed. 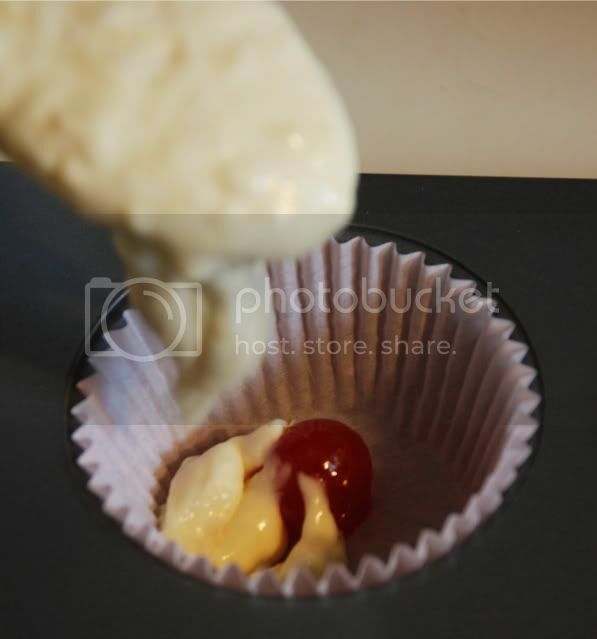 Drop one maraschino cherry into the bottom of each empty cupcake liner, then add batter until liner is about 2/3 full. Bake following the directions on the back of the box for cupcakes. Combine cream cheese, thoroughly drained pineapple and powdered sugar until well blended. Frost completely cooled cupcakes. 1.Not only is this embarrassing, but it's expensive! I am a yarn snob. 2. That'd be McDonalds, Burger King and Wendy's, natch. 3. I do track my calories at www.myfitnesspal.com just to keep myself in a reasonable calorie range everyday. If I go a little over though, I don't sweat it. 4. Also, eat real butter. Not sticks of it at one sitting, but a little butter here and there makes you happy. 5. One recipe I found on Google was over 600 calories for one cupcake with NO frosting. Ouch. No other conventional recipe was less than 250. There might be one out there, but I couldn't find it. Thank you so much, Meri, for being willing to share a recipe with us today! T is a pineapple fiend--I know he will love these! I need to have you over for coffee sometime very soon to get some more insider tips. You have inspired me, and I really mean that! Come back tomorrow for some tips on saving money and feeding your family healthy food at the same time! Thanks for sharing this super yummy recipe! And congratulations to you on your accomplishments!! Wow congrats to Meri! That's awesome & SO inspiring! I love this recipie too, perfect for and end of summer bash :-) Yum! Pregnant woman love food! haha :) This post made my morning. So going to try these this weekend. Thanks! These look so yummy! I love pinapple, but I usually only eat it fresh. Congrats on losing the weight! I need to get serious and finally decided that it's time! 50 pounds since May is amazing and very inspiring. Thanks soo much for sharing Amanda. And Meri, congratulations on the weight-loss. Continued success to you!! Congratulations on your success and allowing yourself to enjoy food while losing weight. This recipe looks great and I can't wait to give it a try! Hi, Meri! Congratulations on your weight loss and for being able to do it in a sensible way! These cupcakes look really good. Cream cheese makes everything better! Great tips! I'm always up for a treat that won't break the calorie bank. Congrats on your weight loss...even when dieting we all need treats! I just finished a great book called "Wheat Belly" that may be of some interest to you. My biggest takeaway: two slices of whole wheat bread have a higher glycemic index than a Snickers bar! Ohh these looks so good! YUM!! These look soooo delicious....making me hungry!! !